Alcatel recently launched its new 10.1-inch tablet, which supports 4G LTE in India. Priced at Rs 10,999, the POP4 10 tablet is available exclusively on Flipkart. With only 7.95mm thickness, the company claims that the Alcatel POP4 is one of the thinnest tablets available in the world. 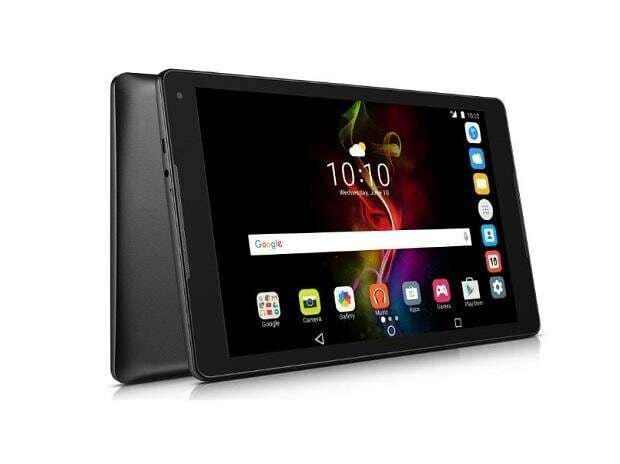 The Alcatel POP4 10 tablet was first unveiled in CES 2018, where the company announced its global partnership with Flipkart for better consumer engagement and retail availability at a time when the tablet manufacturing industry is on an apparent decline. This is a notched-up variant of the previously released A3 10, priced at Rs 6,999. The POP4 10 tablet is a lightweight tablet that looks very sleek. The company claims this 10-inch Full-HD tablet is the best that a consumer can buy for latest features at such a price range in the market. The POP4 10 has a non-mettalic body that although looks nice, collects a lot of fingerprints. The rear camera lies at the corner of the right-hand top corner. The USB port and the 3.5mm jack also sits on the top while the dual speakers are in the front of the tab. The Alcatel POP 4 sports a 10.1-inch full HD display with a resolution of 1920×1080 pixels. The display is bright enough to watch movies and TV series for a long time. The display was bright even outdoors and the colours on the screen remained sharp. It did not hit the eye nor did was it too dull to read in sunlight. There are also some screen modes like vivid and natural with colour temperature adjustment. Powered by octa-core Qualcomm Snapdragon 430 SoC with 2GB RAM, 16GB internal storage and 5GB one-touch cloud storage, the company claims that such features are otherwise rare in a 10K range tablet. Running on Android Marshmallow (v6), the tablet comes pre-installed with educational, security and storage apps, and contains NCERT books from Class 1 to 12. The books are accessible without an internet connection. Moreover, there is no update to Nougat, which means there is no split screen or multi-window mode. Also, the overall performance of Nougat is better than marshmallow. There seemed to be no lag in day to day normal usage but, the tablet is more for reading and doing social media purposes. The games seem to lag and the background apps also slow down the performance. Even though it is coming with almost stock android, the POP4 10 still has bloatware and you can't uninstall some apps, only can disable them. The tablet also comes with dual speaker setup tuned by Waves Maxx Audio which gives a great sound quality as opposed to other tablets in the same range. There is no vibration mode but one can simply ignore such a nuance. It also includes 4G LTE connectivity. The Alcatel POP4 10 comes bundled with a Bluetooth keyboard, which is light in weight and does not require any wire to connect. The keyboard adds to the overall utility, especially when used along with the mouse that connects with the tablet via OTG cable. With Microsoft office apps pre-installed, the keyboard comes handy to do office chores on the go. The POP4 10 tablet packs a 5,830mAh battery, which the company claims can offer up to seven hours of video streaming and 30 hours of talk time. However, on moderate usage, the battery can last up to one and half days. One can stream videos for the whole day before the battery fully drains. The charging time and the charger are a big disappointment, though. The tablet charges fully in between two and a half to three hours and the charger is not beefed up for any fast charging at all. However, the battery backup compared to any such tablet is quite decent. The POP4 10 tablet sports an average camera for users to simply capture moments with no depth to add in the photos. The 8 MP rear camera and the 5MP front camera are both just an addition to complete the specifications. The photos are not sharp and the camera does not even come with many filters. Overall, the camera feature is very decent and not for those who want to enhance their photo capturing moments. Priced at Rs 10,999 the POP4 10 tablet is good for reading and perform minimal tasks. The extra edge of adding NCERT books app may really help the students who use a tablet for their studies and occasional gaming. The tablet at such a price point is, therefore, a great choice for consumers who love to read and stream videos apart from other tasks.